Find everything you need for your baseball program. We offer custom made batting cages and backstops in whatever length and width you need. We have all your field needs covered with pitching platforms, bases, drag mats, and field marking equipment. 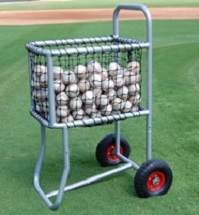 We can take care of your practice needs with pitching machines, balls and pitching and hitting nets.